Source: Photo in my possesion. Featured in the photo above are Adele Bartels, daughter of Henry Bartels, and her Reiniger cousins: Rose/Rosa Reiniger and Klara Reiniger. Twins Klara and Rose are not cousins to Adele. They are aunts to her. Adele is the daughter to the twins oldest sister Frances. But their similarity in ages probably made it seem as if they were cousins. In an attempt to date the photo, I looked at the Wisconsin license plate on the car. It appears to be from 1922 as best I can tell. 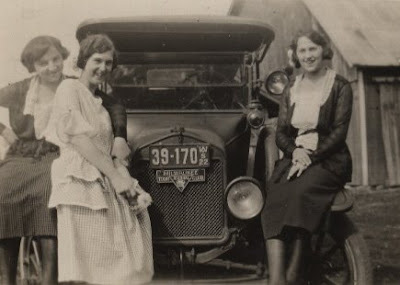 This would make Adele (b.1906) about 16 years old and twins Klara & Rose (b. 1895) about 27 years old.